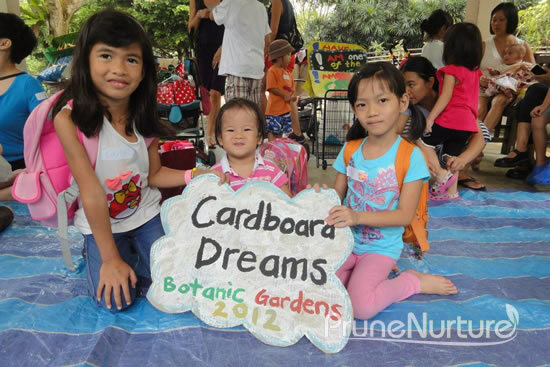 Inspired by Caine’s arcade, Sarah from The Playful Parents organized The Cardboard Dreams on 5 October 2012, which was also Children’s Day, at Singapore Botanic Gardens. As it was our first time creating a game out of cardboard, we had no idea how to start. With the cardboard challenge event looming near, I hope we could at least create something simple yet doable for my girl. Dot and I looked through several cardboard crafts online and we shortlisted a few that I thought she could easily create with a little help from me. Our initial plan was to blow some balloons and then stick them onto the cardboard for the children to burst them with a stick. But after some thought, I decided to abort this idea because it might be dangerous to throw the sticks around. As time was running out, I just left Dot doodling, dotting holes and drawing all over the cardboard while I thought how we could turn her work into a game. I decided to cut three holes of different sizes and then try to find balls that the children could throw or row them into the holes. A simple game we made together – she doodled and drew while I cut and assembled our rudimentary game together. The sky was cloudy in the morning and at interval I could even hear thunder roaring. I quickly checked the weather forecast online and it was definitely not good news. We decided to go ahead to Botanic Garden in the morning and prayed along the way that God will hold back the rain. It drizzled a little and then stopped. It was still good for the cardboard event to continue. As we walked towards the famous Tembusu tree that we went not long ago, we saw some familiar faces there and an unfamiliar one too. 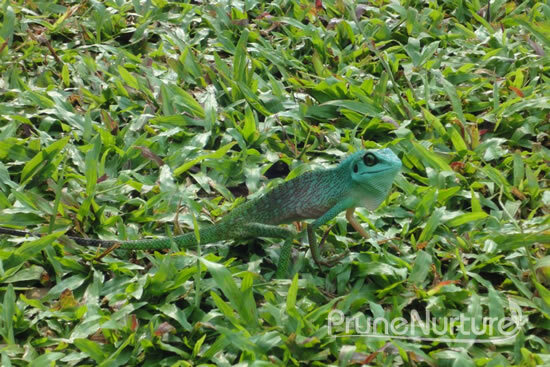 An unfamiliar face we spotted near the Tembusu tree. Everyone started setting up their game stalls and I caught a few glimpses of the games beautiful created by the children and parents. Thankfully, our humble cardboard game still managed to attract some children to play or maybe the sweets and stickers were the ones that drew them to Dot’s gamebox. Each participant was given a big ball and a small ball to row into the holes. 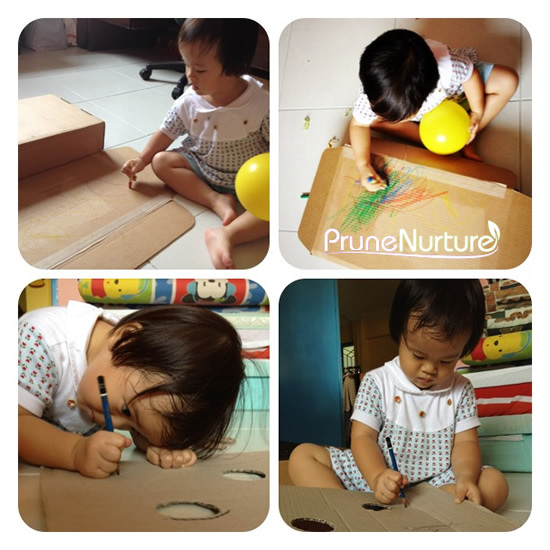 I was very amazed how simple and plain cardboard can be transformed into something fun and creative for all to play. 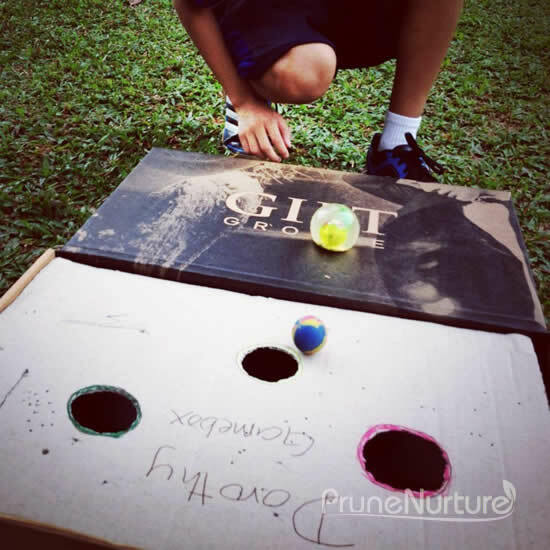 Hop on to Sarah’s post where she shared some of the creative cardboard games created by the children and their parents. 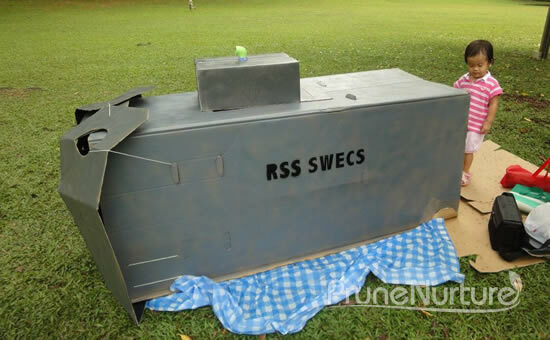 The most impressive cardboard creation was this RSS SWECS submarine created by Elisa and her family. Quite an experience inside the submarine! After one hour or so on the open field, the sky decided to let down some water to nourish the ground. 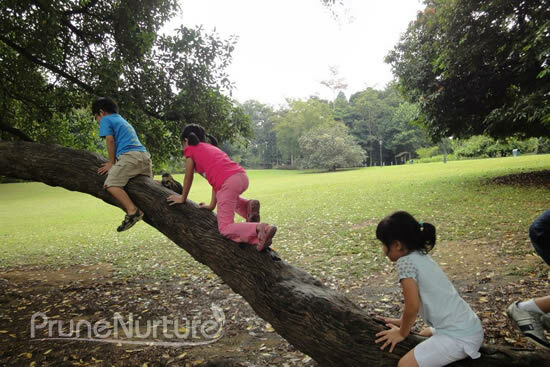 We took our cardboards and lingered under the Tembusu tree where the active children started to climb the tree. 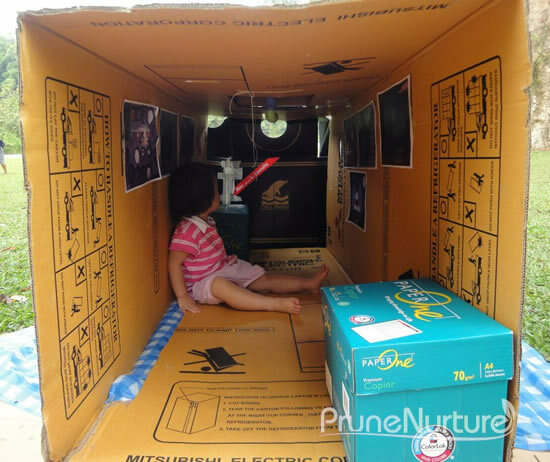 We then moved and took shelter in a pavilion nearby and there Sarah started her cardboard story that captured the children’s attention and imagination. After that we had lunch at Food for Thought where we had good chat with some parents while Dot continued her play at the playground. What a wonderful way to celebrate Children’s Day! Love the simple cardboard game you and Dot created 🙂 Do you shop from Gilt Groupe a lot? I window shop there LOL. Btw, Sarah is a natural in story-telling! Hi Geraldine, thanks for popping by and also the nice compliment on our simple cardboard game…hehe! !